The whole Sakai community gathers once a year at an international conference, while subsets of the community gather at various times during the year for regional or local conferences. 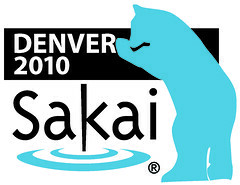 The 2010 Annual Sakai Conference will be taking place in beautiful Denver Colorado. You can still register on our conference website. See and contribute to the Conference Google Map. Follow the link and add your own to the list. Public Transportation (In and around the Denver area.) Note that the online info gives short shrift to the Tech Center. Use the RTD Light Rail routes E and F for downtown. To reach the airport: Take the SkyRide bus AT (must walk or ride some distance to the stop) OR take the 65 from near the hotel to the Stapleton Transfer Center, then the AS.